Concrete Pumps USA has both new and used concrete pumps for sale with 100% financing available. We are the industry leaders and the most trusted source for concrete pumps in North America since 2003. Check out our equipment today and find the pump you need to take your business to the next level. If you require support any time during or after the purchasing process, Concrete Pumps USA is here to help. Feel free to reach by email or by phone during normal business hours. In addition to having the best pumps at the best prices, Concrete Pumps USA is known for American-quality customer service. Whether your primary projects are commercial or residential, a concrete pump can make any job a breeze. Jobs that typically take a whole day or more to complete can be done in no time with a concrete pump. You'll be able to reduce labor costs and better allocate your resources in a way that optimizes your company's profitability. Concrete pumps make a world of difference on the job site. Contact Concrete Pumps USA today or visit our website to see our new and used pumps. We offer the name brands you know and trust at a fraction of their market value. Choose from trailer pumps, boom pumps, telebelts, city pumps, laser screeds, and mobile mixers. Choose from Putzmeister, Schwing, Concord, Reed, and other popular brands. How Will a Concrete Pump Increase Your Profits? Of course, you can also increase your company's profitability with a concrete pump from Concrete Pumps USA by reducing congestion on the job site, dramatically reducing your labor cost, eliminating concrete pump rental costs, and by having your construction crew focus on other tasks. 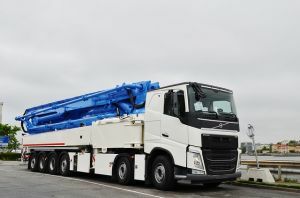 You can also take on jobs that you previously weren't able to because a concrete pump will help you to reach high-rising and hard-to-reach places. Additionally, you'll be able to do a better job on the projects you take on. With a concrete pump, concrete pumping will be completed before the concrete sets, which will improve its strength. Increased productivity, a steady work pace, and taking jobs you previously could not, these are just some of the reasons why you are looking for concrete pumps for sale. If you have found Concrete Pumps USA, you are in the right place. To take on the really large projects, we invite you may wish to purchases multiple pumps, so you can benefit from several pumps pouring simultaneously. Concrete Pumps USA offers full financing on all of our concrete pumps for sale. Just fill out the financing application form on our website. 100% financing is available! We offer 24 to 60-month terms and longer on new and used equipment. In the meantime, feel free to reach out if you need help or have any questions.